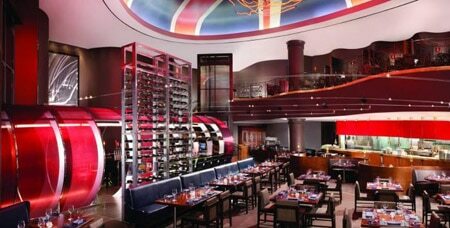 Gordon Ramsay’s contemporary steakhouse at Paris Las Vegas. 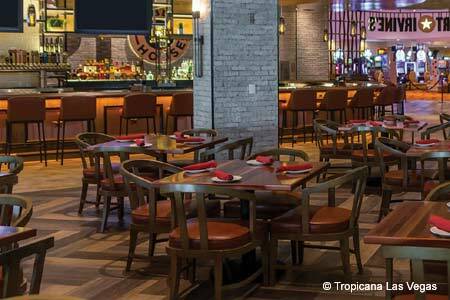 : As you enter Gordon Ramsay's first Las Vegas restaurant, located at the Paris hotel, you are guided through an architectural representation of the Chunnel station in London, symbolic of crossing over from France to England. A Union Jack flag on the ceiling is joined by a red neon sculpture depicting the blur of Ramsay’s hand movements when making his trademark beef Wellington. Ramsay’s signature fish ‘n’ chips (made with sea bass) is on the menu, but the stars are the 28-day dry-aged steaks, which are displayed via a trolley that is brought to your table. We like the tender eight-ounce American Wagyu rib cap. Starters shine in their own light, especially the butter-poached, chorizo-stuffed Maine lobster with brandied lobster cream sauce; another good choice is the cauliflower curry soup with roasted florets, bay scallops and vadouvan curry. End with the sticky toffee pudding cake with brown sugar-butter ice cream. More than 300 bottles of wine sourced from five continents are joined with 30 beers, including Innis & Gunn Rum Cask Oak Aged Beer, Ramsay’s favorite from his Scottish homeland. All can be perused using SmartCellar touch screen iPads.